Thanks to Milanoo for providing me with free shoes to review! Recently, I had an opportunity with work with this awesome company, called Milanoo. Milanoo offers a great variety of products, from shoes (The shoe selection is AMAZING!) bags, clothes, and more. If you have a passion for fashion, this is the place to shop! All of their items are competitively priced.. You can get some of the hottest new shoes for under $50! When it came time to pick out what I wanted to review, I had such a hard time choosing. I knew I wanted a shoe, but I just wasn't sure what style or color I wanted. Their selection of products definitely didn't help, because it's just so massive! I ended up browsing for probably a good 2 hours before I finally decided on what to pick. I ended up choosing the Blue 5 1/2" High Heel Suede Platform Pointed Toe Fashion Shoes. 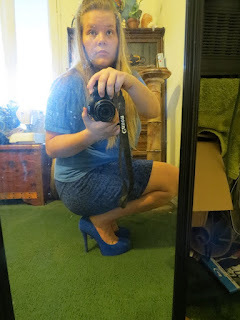 These shoes turned out to be everything I wanted, and more! For the longest time, I have been wanting a solid colored pair of platform heels. Why? because they can be paired with so much! I love when I see solid platforms like these paired with skinny jeans and a regular tee - It just looks so dressed down.. But then when you get the glimpse of the shoes, your like, wow! The best part about these shoes? 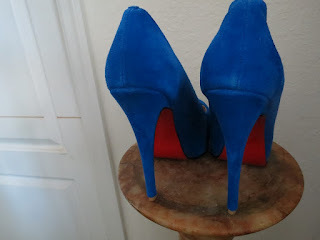 They have red soles! I've always wanted a colored sole, because it's so eye catching, and really pops vs. the regular black soles that you see. The quality of the shoes is great as well. The outside is a thick suede (which looks awesome, as you can see.) When you first take the shoes out of their package, they smell awesome, and really expensive. It's almost hard to believe this pair is available for less than $50. I think these shoes are extremely fun! And I would highly recommend them (Especially for the great price!) I'll definitely be hinting to Milanoo for next Christmas, to my family ;). Look at those shoes. 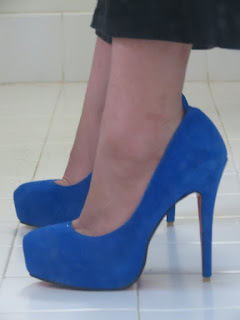 I love them and I love the color too! Love them but I am afraid I could never pull them off. 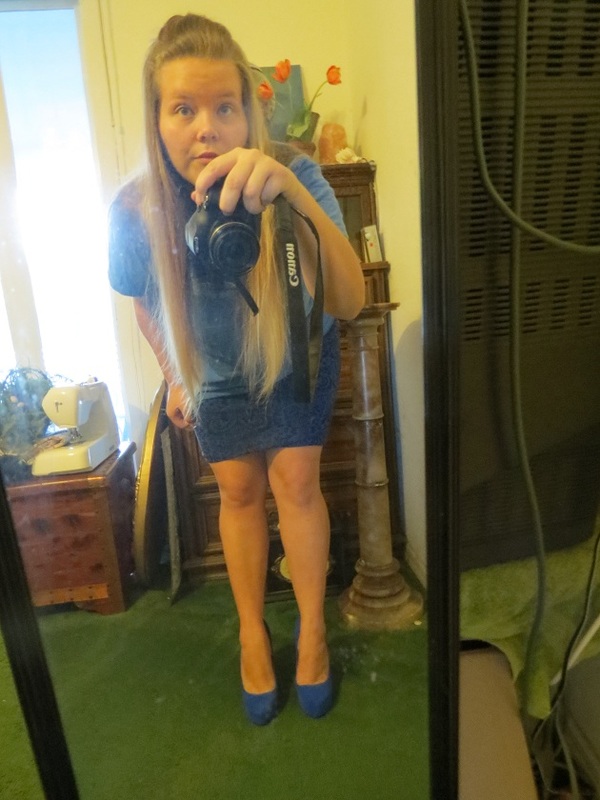 LOL I am so used to flats and flip flops, not sure I could rock heels again! HAHA! I like the ones at the top. Wow! Those are HIGH! Glad you like them so much. Those shoes are phenomenal. I love them, they look great on you, they're super fun, and would look great with a whole variety of things. Lovelovelove! Also, they look extremely similar to the shoes on the Keeping Up With the Kardashians commercial that aired pretty much non-stop before the premiere of their newest season. I have officially proven I know way too much about the goings-on of E! I love the color of these! I would break an ankle in something like these, but they would stand out amazingly with the right outfits! Love those pumps! The color is a beautiful bright blue, I WANT! Those shoes look awesomem and that price is great! I will be checking out their site. I love pairing great heels with skinny jeans too. Did you find them to be comfortable? Love those shoes although I'm pretty sure I'd break my neck if I tried to walk in them! Those shoes definitely look like they cost more than $50! Great deal! Cute shoes! And for a great price. What more could a girl want? I wish I felt comfy in suede. Those shoes look lovely! I'd fall right on my face in them...but they are just darling!!! Wow. They are GORGEOUS! Wold go just perfectly with my little black dress!